The PICPgm Development Programmer Software is a free and simple In-System-Development Programmer Software for the Microchip PIC microcontrollers. The programmer software is available with a Graphical User Interface (GUI) and a Command Line interface. The programmer software runs on Windows 98/ME/2k/XP/Vista/7, 64 bit Windows version Windows XP x64/Vista x64/7 x64, Linux (command line version only) and MacOS X (command line version only, experimental)! To interface the PC to the PIC microcontroller a programmer hardware is necessary. PICPgm supports a lot of different programmes which can be connected to the PC via the centronics port (printer port), serial COM port or USB. Up to now many different PIC devices are supported as well. A complete list of all supported Microchip PIC microcontrollers can be found here. More detailed information about the programmer software can be found in the Software section. The latest programmer software can be downloaded in the Download section. The needed programmer hardware itself is very simple and can easily be built up using a few standard componets. PICPgm supports all kind of serial port programmers as well as parallel port programmers. Furthermore a USB programmer is supported. The programmer pins can be configured through the graphical user interface. The most popular PIC programmers (e.g. JDM, Tait, Microchip AN589 programmer, El Cheapo, ...) are pre-configured and will be automatically detected by the software. More detailed information about the programmer hardware can be found in the Hardware section. PICPgm supports PIC10F, PIC12F, PIC16F, PIC18F, PIC24H, PIC24F, dsPIC30F and dsPIC33F microcontrollers. A more detailed list of all supported PIC microcontrollers can be found in the Supported PICs section. First MacOS X version of PICPgm released!Download here. 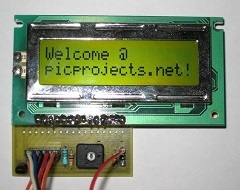 PIC microcontroller projects, including source code, description and schematics.